At a quarter after 5:00 this morning, I was surfing the Web on my Galaxy S5 in a fit of insomnia when I came across this article on CNN: Back to school: Why August is the new September. The author of this piece, Daphne Sashin, has been asking herself the same question I’ve been pondering myself for years–why the hell does the school year start in August and not after Labor Day in September? There are 12,000 school districts in the United States, and when the school year should begin depends on the laws in each district. Although public schools in the Northeastern and Northwestern states begin the school year after Labor Day, most Southern states, including my home state of Florida, start the school year at least two weeks before the national holiday if not sooner. I was baffled when I found out that three states–Hawaii, Indiana, and Arizona–already forced the students back to school in late July. Don’t believe me? Take a good look at this map. Turn your attention also to the list of school start dates in Miami-Dade and Broward County. I tried looking up the school calendars from 1998, when I was in Pre-K, but they didn’t turn up. So, I had to start the list from 2001, when I moved to Broward County from Miami at the age of 7. I apologize if my handwriting is illegible for some. In Florida, all 67 school districts open their schools at least two weeks before Labor Day to allow more instructional time prior to state standardized exams in early spring, the bane of the existence of both students and teachers alike. Earlier this year, the State House had the audacity to pass legislation that would allow schools to start the 2015-2016 academic year as early as August 10, which would make tourist-dependent businesses like Orange County’s Walt Disney World and Universal Orlando lose two to three weeks worth of money than they would if school started later. Then again, it’s up to each district to decide whether or not to change its planned opening to accommodate for said law. If you look closely at the list above, this is not the first time this has happened. 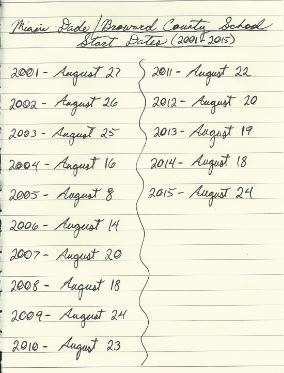 When I was in 5th Grade (2005), school started on August 8, which was an unusual start date by even my mother’s standards. They did give me and my brother, who was in 8th Grade at the time, a four-day bereavement period to see our ailing father in Boston the next week but still, they should’ve given us more time to attend his funeral as soon as he passed away by letting school open the same day as our Northeastern cousins: the day after Labor Day. One year later, Florida’s Legislature was smart enough to enforce the 14 days before Labor Day rule, allowing the state’s school districts to, as the name implies, open their schools two weeks before Labor Day. When I have kids–if I even want kids at all, that is–I hope they get to see the day when their schools start the academic year in September, not August like my school system. Otherwise, it’s homeschooling for them, and we can start the day after Labor Day. 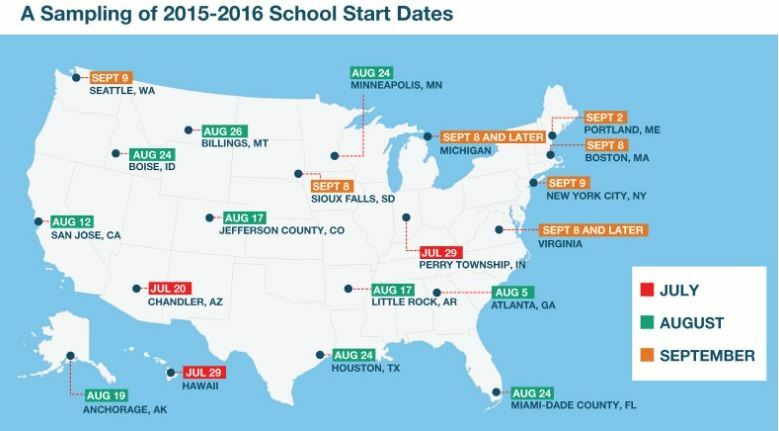 The U.S. Department of Education needs to understand that autumn truly starts in September, NOT August.